Canadian Corps refers to two operational corps formed in Canadian history. This article refers to the formation of that name formed in the First World War. For information on the Canadian Corps in the Second World War, see I Canadian Corps. The Canadian Corps was formed as an operational corps in France and Flanders, after the arrival of the 2nd Canadian Division in France in Sep 1915. Canada had originally envisioned contributing national "contingents" and had not planned on the unprecedented act of forming a formation of Canadian units. The Minister of Militia and Defence, however, insisted that Canadian troops remain under national command and as one entity. Once two divisions had been formed, with other divisions in the process of being formed, the creation of a corps headquarters to administer and command them was a natural. The Minister's representative in London wrote on 1 Apr 1915 suggesting that a corps be formed. Historian David Love notes that this is the first known mention in the historical record of the creation of a corps.1 At this point, the 1st Division had not yet seen major combat and the 2nd Division was not in Europe yet. The Imperial Army Council in Britain, however, had also concluded that a Canadian Corps would be appropriate, suggesting as much on 15 Jun 1915 to the Canadian government. The Canadian Corps became a reality on 13 Sep 1915. The corps was small by British standards, which had a minimum of three divisions under command, at least initially. The Canadian Corps was expanded by the addition of the 3rd Canadian Division in Dec 1915 and the 4th Canadian Division in Aug 1916. In Feb 1917 the organization of a 5th Canadian Division in the UK began but was broken up a year later before it was fully formed, and used to reinforce the four divisions on the Continent. Even so, with four divisions, the Canadian Corps was larger than British corps by 1918, especially since manpower shortages led the British to reduce the strength of each infantry brigade from four battalions to three, while Canadian brigades remained at full four-battalion strength until the end of the war. Due to Canada's insistence that Canadian soldiers fight together, the Canadian Corps was unique in that its composition remained constant throughout the war, unlike British corps in which divisions were shuffled often. The Canadian Corps was originally commanded by British Lieutenant General E.A.H. Alderson until 1916 when another British Lieutenant General Julian Byng took over. When Byng was promoted to an Army command during the summer of 1917, he was succeeded by the Canadian commander of the 1st Canadian Division, General Arthur W. Currie. The Canadian Corps was generally regarded as well trained and motivated, especially after the capture of Vimy Ridge. The Canadian Expeditionary Force as a whole suffered 60,661 killed during the war, or 9.28% of the 619,636 who enlisted. Brigadier General A.G.L. 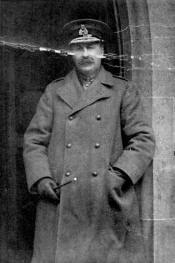 McNaughton, Commander of Canadian Corps Heavy Artillery in 1918.